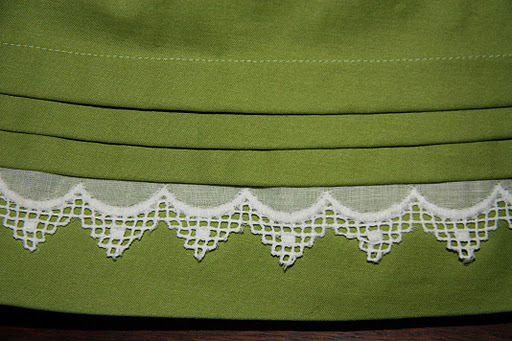 Fittingly, I’ve taken a tip from Sarai Mitnik’s book (The Colette Sewing Handbook) and used her ‘hidden pleat’ detail from the pretty Pastille dress on the hem, including some of that amazing lace I bought from one of my favourite Etsy sellers, dishyvintage. 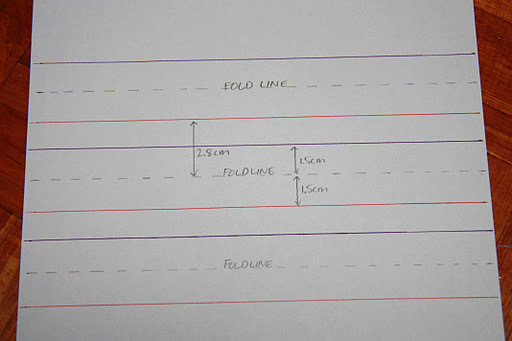 The dotted line represents the centre of the pleat, the red line the bottom fold, and the purple line is the stitch you would see at the top. To ensure the three pleats overlapped so you couldn’t see the stitch line between pleats, I made the distance between the pleat centre and the bottom of the next pleat up 2.8cm. This gives me an overlap of 2mm. 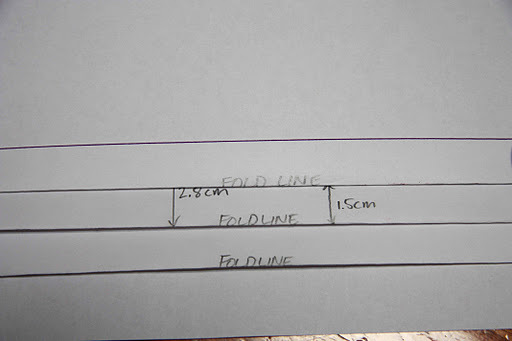 To calculate the additional length needed to add to my hem, I measured the length of the folded piece of paper and minused it from the length of the flat paper. I like this detail so much I’m thinking of elongating the short sleeve a tad to include a singular pleat and row of lace here as well. So this dress is well under construction, thanks to the arrival of more rayon seam binding. I’m currently not the owner of an overlocker (soon to be rectified!) and my beloved sewing teacher takes the month of January off. So no access to an overlocker until February. Actually, I’m really liking the seam binding. Probably a great thing because I went out and bought nearly 250m of the stuff! This pattern comes with a cummerbund style belt, but I’m after something a little more, retro? A slimline belt with a buckle perhaps. I’ve got a couple of buckles which I could use to make one, but I also really like the idea of using one of those diy belt-covering kits. Does anyone know any good ones I can buy? 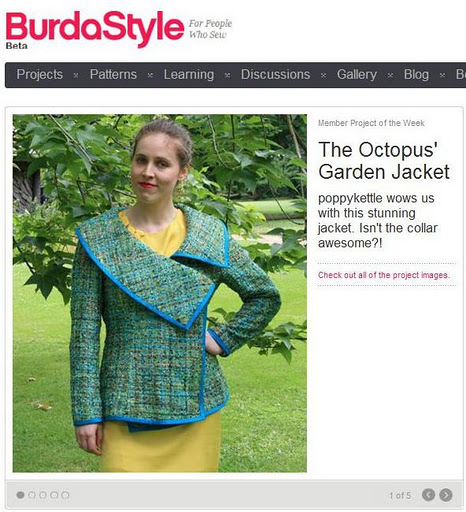 And many thanks to those who alerted me to the fact my Octopus’ Jacket is a Burdastyle Member Project of the Week. :) woohoo! Really love the pleats and I have that book too – must sit down with a cuppa and read properly. 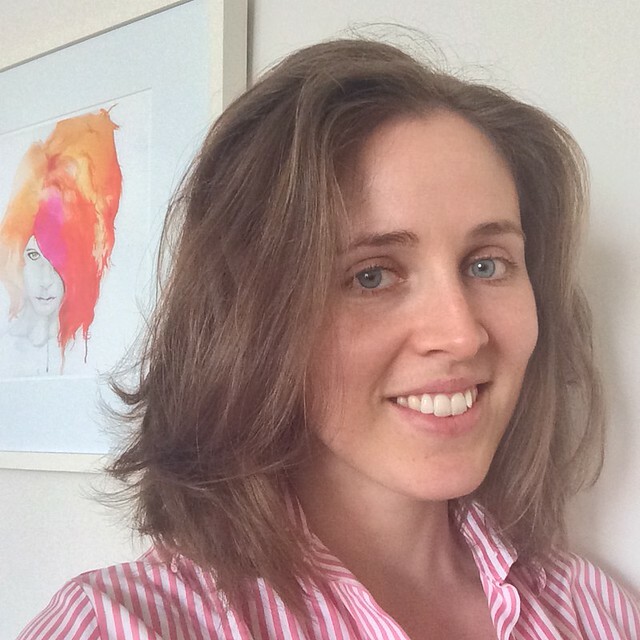 Your tute on the pleat is great – very mathematical – wonder where you get that from? Congrats on the Burdastyle Member Project. Overlocker – I love my Babylock!!! This looks so cute, I'm really excited to see the final product.Where did you get your seam binding from? I've never seen rayon binding before, but I think I'd prefer that to the poly stuff I've used. Thanks Evelyne – I've been researching overlockers most of this afternoon. Time I took the plunge!Lara, I bought the rayon seam binding from Fabric.com after seeing Laura Mae from lilacsandlace.blogspot talk about it. I've never seen it in Australia – but the stuff is amazing! It adds practically no bulk to your seams. Time consuming, but a pretty finish! 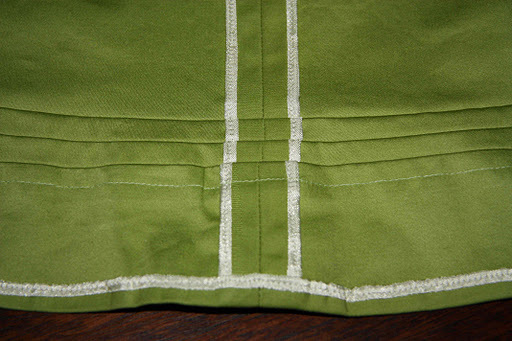 I LOVE that green fabric!